While I'm busy slowly sewing my strip quilt blocks. I needed to start another project. What can I say, nothing keeps my attention for long :-) So, I decided I'm going to make a Mug Rug. My goal is to make a design I can use for the end of February and beginning of March so It's going to be a green mug rug. You never know, I might make this a series. I'm going to try two different designs. One will be a shamrock and the other will have embroidery on it. I'm in the design / development phase right now so come back and see the results tomorrow or Saturday. 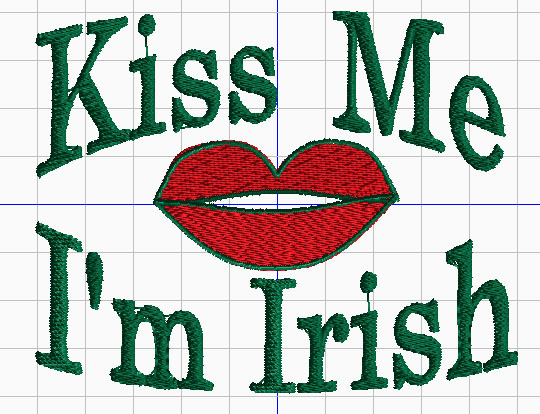 Here's the embroidery file I created. I'll have it available for free download as well. I am a new blogger, quilter and follower! Lots of new things huh? I love your blog. I am new to this and still learning. I enjoy your blog. I was reading your Kcup blog. I use Keurig too. I actually started due to a broken hip and being laid up in bed for 3 weeks. I was staying with my mother and she had a 2 story home. I had to decide to either take up perm residence on her couch or take up perm residency upstairs since tackling the stairs was not an easy task. Even when I did, the idea of carrying anything was out of the question. So in order to get any coffee my only option was to get some one cup server. I purchased a keurig and have never gone back. I am the only one that drinks coffee in our house. My dh never has liked "the stuff" as he calls it. So it also makes economical sense. We have even purchased the cup that allows you to use your own coffee which also saves us money. I recommend it highly! It paid for itself in no time at all. Anyway, please stop by my blog. Remember it is a new blog. I have gotten some great advice on the pictures taken by my cell and I have discovered how to make them much better! I am doing a blog on remodeling my sewing/quilting room and many other topics to come. I hope you stop by! Take care! lol..oh and btw I am IRISH too! lol Very actually. In case you cant get there by my name (still trying to get that worked out) here is my link..